The amounts shown on your Shopping Sheet are estimated and not guaranteed. Please see the ICC Financial Assistance Office if you have questions regarding your aid. 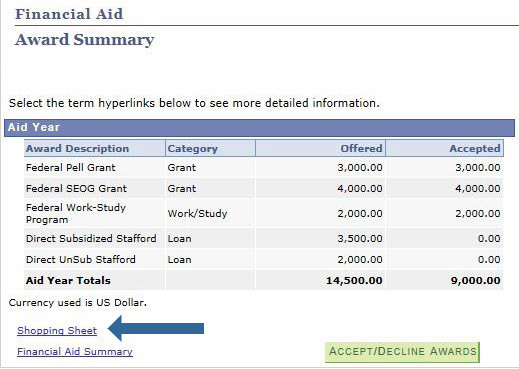 The Financial Aid Shopping Sheet is a tool used to notify students about their financial aid package. It is a standardized form designed by the U.S. Department of Education to simplify the information regarding costs and financial aid so students can easily compare institutions and make informed decisions about where to attend school. The Shopping Sheet can be located on your E-Services Financial Aid page. The Shopping Sheet award numbers are based on your initial enrollment or estimated full-time enrollment if you were awarded before you were enrolled. The financial aid award may be updated after census date of the semester, anytime a change is made to an award (ex. Scholarship added, Pell adjustment, loan adjustment, etc.) or if you add or drop classes. The download button is not a supported feature. To save a copy you may take a screenshot of the page or print the page from the browser. See below for more information regarding the Shopping Sheet items.